Visit Argento's haunted manor in Dreadful Bond. Dario Argento, the Italian horror director behind Suspiria, Deep Red and that one where Harvey Keitel strangles a cat during a photoshoot, is currently dabbling in games. He's not swapping his director's cap for a developer one, but he is serving as creative supervisor for Dreadful Bond, a first-person psychological horror game set inside an abandoned manor. Argento's been scaring the crap out of people since the '70s, and while this is the first time he's been involved in a game, he did make the first Italian film to use CGI, The Stendhal Syndrome. A spooky house is a bit familiar for psychological horror, but they're still fertile ground for scares. It's a labyrinthine prison full of disembodied voices, dreamscapes, memories and shadows, apparently, which hide the secret of the "Empuros", whatever that is, and some terrible events from the manor's past. The story of the manor is told quite literally through shadows. Silhouettes recreate past moments, captured by developer Clod Studio shooting real actors. The house transforms, too. 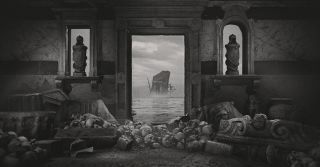 A door might collapse to reveal a coastal temple and, beyond it, the ocean. Everything you see in the manor started life as a real object, from boring drapes to creepy artefacts. I do love me some photogrammetry. I like saying it, too. It's a fun word! The team traveled around, photographing eerie locations throughout Italy, and making new props by hand when they couldn't find something. Instead of a conventional trailer, the studio and Argento have put together a short film, For Bridget, which showcases the manor and its creepy living shadows. It's not short on style. It follows a pair of scholars exploring the manor 30 years after the events of the game. Not a great idea, apparently. It doesn't bode well for us, either. It's a bit undermined by the voice acting, but otherwise weird and spooky stuff. Clod Studios is ready to hit the final phase of development, almost. It's currently trying to get $67,347 in Kickstarter pledges, at which point it can start the final phase immediately. From there it's expected to take 12 to 15 months, so we probably won't be seeing it sooner than December 2020. There are more details over on Kickstarter.